For more on what to expect from the LSU offense and general comments, please see Part I published on Wednesday. 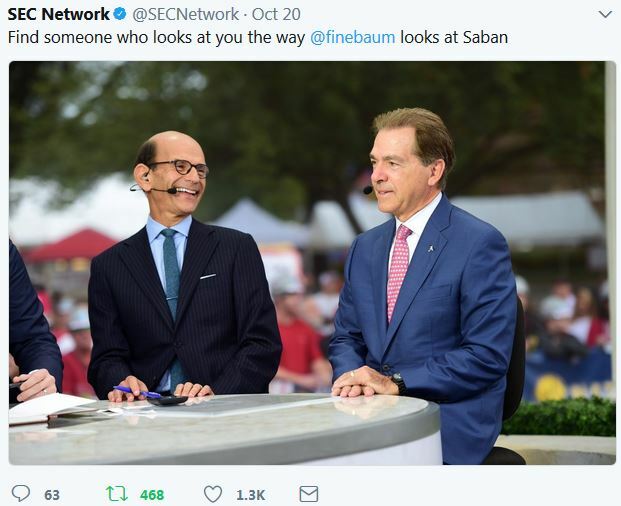 This page links the major previous discussions of the LSU-Alabama Series. LSU seems to have better kickers, but I’m not going to spend any time on that point. What made me decide to split this into two blogs was how annoyed I was with how many people were picking Alabama to score 40+ while picking LSU to score <22. I listened to a couple of somewhat credible prognosticators on YouTube who did that based on Alabama’s stats. One of them (SECfans, which I mentioned before) actually replied to my comment and asked if I thought Alabama’s offense was severely overrated due to the schedule. I said that I didn’t think they were severely so, but in all the years I’ve been watching college football (I would say I had something like an adult appreciation of it starting in the mid-90s), there hasn’t been a top team who scored over 40 every game. In the video, they had mentioned the 2005 Texas team that scored 41 points in the title game against USC. A neutral-site bowl game isn’t really analogous to Tiger Stadium. What might be analogous was when the Longhorns went to Ohio St. that year and were held to 25 points. Also, late in the season the USC team in question had allowed 42 points at home to a Fresno St. team that would finish with 5 losses. Vince Young runs for a touchdown in the 2006 Rose Bowl. The best offense I’ve seen through 8 games was probably 2010 Oregon. They had an even higher average (by less than a point, but still) than Alabama does now at 54.8 points per game. That was despite having played a top 10 team at home and a top-25 team on the road, neither of which the Tide has done. The 9th game was consistent with that, but in their 10th game, the Ducks went on the road to play the unranked Cal Bears and only won 15-13. That was a Cal defense that would allow three different teams to score 48 or more against them. Cal finished with a losing record that year. I’d say it’s pretty likely LSU has a better defense this year than that team did then. The Cal (Berkeley) defense held Oregon to about 40 fewer points than the Ducks’ average in their 2010 matchup. One of the best SEC offenses was the 1996 Florida. Early on the Gators beat #2 Tennessee on the road, but apart from that game the Gators averaged 54 points per game through the first 8 games. Then in early November, the Gators escaped Nashville (hardly an intimidating road environment by SEC standards) with only a 28-21 win. A few weeks later, Florida St. held Florida to 21 for the Gators’ only loss of the season. Of course Florida would then run away with the national championship against the Seminoles, 52-20. Florida’s Danny Wuerffel led the Gator offense to over 50 points per game before being brought back down to earth in Nashville and Tallahassee (pictured). I don’t mind if people are picking Alabama to score 35, for instance. Maybe this Alabama offense is able to produce points just as well as and just as consistently as 1995 Nebraska, who was only held under 40 twice and never below 35. That was the only team since World War II that won each game by at least 14, but the team who got within 14 was unranked and playing in Lincoln. I just need to see this year’s Alabama play a better defense than Texas A&M or Missouri to believe they’re better than that Nebraska team. Despite the Cornhuskers’ having won the national championship in 1994, the voters in 1995 were skeptical of Nebraska and did not move them up to #1 until the Huskers had beaten top-10 teams in consecutive weeks. I can also refer to past games in the LSU-Alabama rivalry. I mentioned the 2013 game in the last blog. LSU didn’t keep Alabama very far below their average, although they were on pace to do so for most of the game. More relevantly to this blog, the Tigers had averaged 40 points per game going in, and Alabama held LSU to less than half of that average. The Tigers have a lot of work to do if that’s the best their defense can do this year, one reason I think the Tide wins, but 27 points wouldn’t make it an impossible task. Alabama teams of the last few years probably don’t compare to this one in terms of how strong the respective offenses and defenses are, but I think we may also be able to learn a little from 2011 and 2009. People act like in retrospect the 2011 regular season game was destined to be in the single digits, but it really wasn’t. I don’t remember the over/under, but I’m pretty sure it wasn’t 16. Alabama was averaging 39 points per game and had only been held below 37 twice (27 @ Penn St. and 34 against Vanderbilt). LSU had almost the exact same average despite having played Oregon and West Virginia, two eventual winners of BCS bowls. Only Mississippi St. had held the Tigers below 35 (like this year, LSU scored only 19 against the Bulldogs). Granted the points given up were lower in both cases in 2011 but not ridiculously so. LSU has only allowed one team to score over 21 this year (but two right at 21). They’d allowed two to score over 11 in 2011. Alabama has only allowed two teams to score more than 14 points this year. In 2011, they’d allowed double digits 3 times. So maybe not 9-6, but 20-17 wouldn’t be a shockingly low score. I want to mention one other Alabama team, and that’s 2009. That was Saban’s third year and his first team there that really tipped the SEC off about what was to come. The Tide opened against #7 Virginia Tech and then played four unranked opponents, two in SEC play and one on the road. That’s not a body of work similar to what they have now, but in those five games the Tide scored at least 34 points in each one and averaged 40 points. Patrick Peterson grabs an apparent interception in Tuscaloosa in 2009. The pass was ruled incomplete. LSU may not have won the game in Tuscaloosa, but a different call here could have changed the score. The Tide went to #20 Ole Miss and point production fell by 45% as they only scored 22. A similar reduction in this case would result in the Tide only scoring 30. Ole Miss had a good defense in 2009, but maybe LSU’s is better this year. The Rebels did allow 33 to Auburn and 41 to Mississippi St. that year. I don’t envision LSU giving up that many to an unranked team this year. It’s odd for two teams in the same division to have only one common opponent at this point, but in this case it doesn’t tell us very much. It was Ole Miss, who really didn’t have much of a chance in either game. I think the games worth considering are ones where either LSU or Alabama had to get out of their comfort zone in some way. The Rebels did not force either team to do that. Again, the best team Alabama has played is Texas A&M, who I believe is justifiably outside of the top 25 in the coaches poll. The Texas A&M defense, which made Mississippi St.’s Nick Fitzgerald look like a Heisman contender doesn’t compare favorably to LSU’s defense at all. Mississippi St. scored a combined 16 points against LSU, Florida, and Kentucky, 12 less than A&M gave up. The point being that we really don’t have a model when it comes to how Alabama does against a defense that can really affect an offense the way LSU’s affected Fromm of Georgia and Fitzgerald. If it’s a similar game with Alabama holding the opposing offense in the low 20s, LSU will likely take at least one touchdown opportunity away that A&M couldn’t, especially given that A&M was playing in Tuscaloosa. I haven’t seen anyone suggest this, but I did want to add a caveat. I wouldn’t be upset if someone thinks Alabama wins 41-34. That wouldn’t show LSU’s defense is almost as bad as A&M’s; it would show Alabama’s offense had to keep going in high gear the whole game when it could pretty much relax in the second half against A&M. I’d be surprised to see that much offense from LSU, but they did score 36 against Georgia despite settling for field goals 5 times and despite a quarterback who could only complete half of his throws. A better measuring stick for Alabama offense (though the Tide defense did extremely well) is the Missouri game. That was the best comparison I could find to a tough game Georgia had to play (partly because it was on the road) before coming to Baton Rouge. Missouri had been the only team to score more than 17 against the Bulldogs (they scored 29) and the only team to come within 14 points (and that was despite a defensive touchdown by Georgia). Kobie Whiteside in Tuscaloosa on October 13. For Alabama vs. Missouri, I’m more going to look to see what we can gather about things LSU might be able to do on defense. Missouri did have the second-closest game with the Tide so far (after A&M), but more impressively (and more relevantly to this blog) the Tigers are the only team to hold Alabama below 40, and they did this in Tuscaloosa. Giving up 39 isn’t that impressive on its own (unless LSU really does give up 41 without producing much on offense); but as I’ve said before, you can score into the 40s against almost anyone if you’re given easy points. Twice while the game was still competitive, Missouri committed a turnover deep in their own territory. So where it was 27-10 with 10 minutes left in the half, it probably would have been Missouri ball down only 17-10. I’m not that Alabama didn’t deserve to beat them like they did, but what I am saying is the Missouri defensive unit did even better than Alabama’s point total indicates. It’s also somewhat impressive that Mizzou limited Tua to only 2 of 5 on third downs and 12 of 22 overall (though it was still an average of over 10 yards per attempt) with only one positive run. Missouri has neither a good pass rush nor a good secondary. I couldn’t get the stats on how many sacks and hurries they had against Bama, but I know they had one sack and no hurries against Georgia. That’s one reason LSU was able to limit Georgia to fewer scoring drives than Mizzou had. LSU was able to improve significantly on what Missouri did with Georgia. Even if we cut out the defensive score, LSU roughly cut Georgia’s point-scoring in half. So I think the low end of Alabama’s point total (barring a disaster or freakishly low-scoring game) is a lot lower than some people have it. I would put it in the low 20s. So I think the route for LSU to win would most likely be LSU scoring between 24 and 31 and Alabama scoring 1-7 points fewer. My prediction is that LSU holds Alabama to 31, which is two touchdowns fewer than Texas A&M allowed, and that the Tigers score 24. I think chances are the Tigers score closer to their point total against Auburn and Florida than the point total against Georgia. Most other people seem to be picking either a narrow LSU upset or a complete blowout by the Tide, either of which could happen of course, but I think these are two really good teams and LSU is just slightly outmatched. It was my sad duty to update the LSU/Florida series. The Gators lead by three games in Gainesville and by four games overall. The Steve Spurrier tenure gave them a comfortable lead that LSU has only slowly narrowed of late. For the series, this was the fifth game in a row (and 10th since 2004) decided by one possession. I said this would be a tough game, and that means we had to play better than we did. We didn’t block or tackle well enough. The passing game was all right, and we had a couple of good long runs but nothing consistent. That said, I was furious about the officiating. On almost every play, an LSU defender got tackled by the Florida offensive line. Meanwhile LSU had to be really careful to avoid calls for holding and hands to the face. Florida was flagged for a personal foul once that I recall, but they were punching and slapping LSU players between plays all day too. So I’m not going to claim we deserved a win here; but if I’m honest, neither did Florida. They took advantage of bad things LSU did and the rules as they were being enforced, so the Gators do deserve credit for that much. My final score prediction was 24-20 in favor of LSU, but if you take out the first turnover we have another scoring drive. You take out the second turnover (a pick six) and my guess for Florida’s score was exactly correct. So I was really close in how much offense to expect from each team. 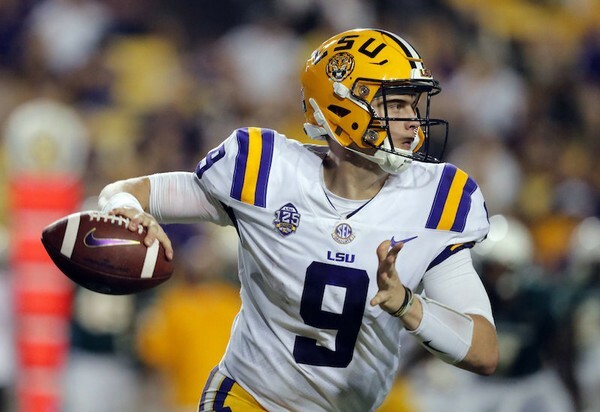 LSU QB Joe Burrow (pictured in an earlier game this season) needs to get better blocks and make better decisions if LSU wants to compete for championships. The second one was an unnecessarily hurried pass on 3rd and 4 for Burrow’s first interception at LSU. If he throws the ball away (I couldn’t tell if there was anyone else to throw it to), I think we were going to go for it. The clock was under 2 minutes, and we’d already used two timeouts. The only really successful offensive drive of the second half was all runs, so there was no reason to be confident in getting the ball back and scoring even if we’d had the timeouts. The two late drops (on 2nd and 3rd downs on the last set on downs) were frustrating, but as I just explained, the chance of a last-second touchdown drive was pretty low anyway. I’m not making excuses, but offensive line is a tough position, and even if you’re deep when the season starts, you might not be at this point. I don’t think there is one position where you would have called LSU deep going into the season, but that certainly wasn’t one of them. We needed better quarterback and receiver play to make up for the problems. In short, we played like the #25 team I picked LSU to be going into the season, but that’s not enough to win at Florida. LSU had a good first 22 minutes and a good fourth quarter against Louisiana Tech, but it’s concerning to give up 21 consecutive points to two opponents in a row. Apart from the touchdown drive at the end of the first half against Southeastern (SLU), LSU has not played well around halftime and the third quarter in any of its first four games. The Tigers were way out in front of U. Miami and SLU; but in the case of U. Miami, ending a game with no touchdowns in your last 8 drives (not counting the kneel-down at the end) isn’t desirable in my opinion no matter what the score is. LSU may have been shut out in the second half against SLU if they had not recovered a fumble at the SLU 18 late in the fourth quarter. The troubles started against Auburn after about a quarter and a half instead of two quarters, and that’s the same thing that happened against the Bulldogs on Saturday. We were up 24 against the Bulldogs instead of the 10-point lead at Auburn, but the play from that point until the fourth quarter was similar with identical results (outscored 21-0 in both instances). So there is a wide range of teams that could blow out LSU if the Tigers were to play like that for a full game. To look on the bright side, LSU could probably beat anyone if they eliminate that mid-game lag. If the Tigers don’t play better, they may well lose the next game against Ole Miss. See here for more about that rivalry. That said, I don’t see anyone other than LSU I want to put #4. Clemson’s game against Texas A&M and Oklahoma’s game against Army were more concerning, and no one has the pair of top-10 wins the Tigers have. I thought about dropping Ohio St. due to not having played anyone except a team that just got beaten soundly by Texas, but I may have gotten some flak if the first three teams were all in the SEC. The Buckeyes’ strength of schedule should improve significantly in the next two weeks though, so I’ll leave them where they are for now. 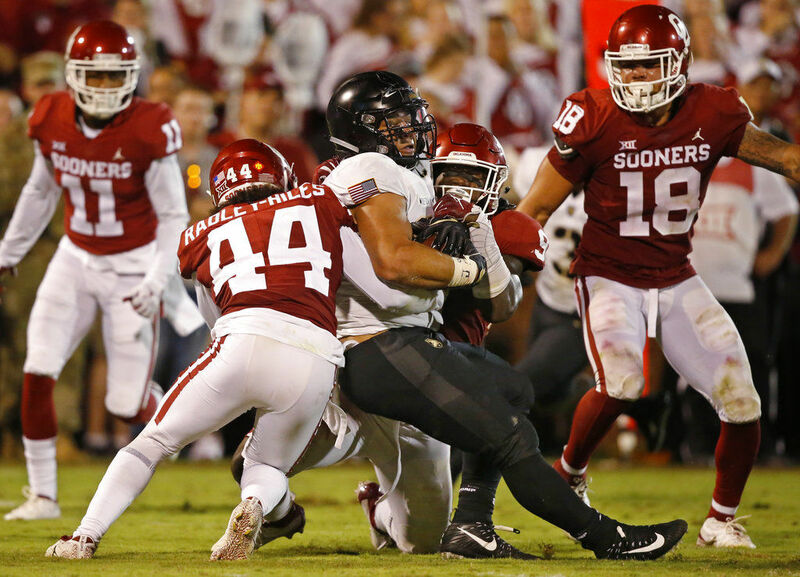 Army’s ground game and ball control were almost enough to beat Oklahoma in Norman on Saturday. I know I ranked Army #25 last week, but that’s not really a good excuse for Oklahoma to go into overtime against the Knights/Cadets at home. After an uninspired win at Iowa St. the week before, I’m not really feeling the Sooners right now. I’m phasing out the feeling element of this as I always do in late September, but going solely by the numbers wouldn’t even put OU in the top 10. I haven’t been impressed with other Big XII teams either, but the toughest games may be away from home: TCU, Texas Tech, West Virginia, and Texas (in Dallas). The remaining home schedule is Baylor, Kansas St., Oklahoma St., and Kansas. Auburn didn’t do anything wrong; but even assuming they win next week, 3 of their four wins will be Alabama St. (who has lost by at least 34 to every Division I opponent), Arkansas (who probably still won’t have any FBS wins), and Southern Mississippi (whose only FBS win is over Rice). It’s just time to start factoring in strength of schedule more. Auburn has Georgia and Alabama later of course, but they won’t get credit until they play one of them. Central Florida, the (AU) Tigers’ opponents in the Peach Bowl, and Michigan were even further from a ranking in my formula, so they dropped more. Mississippi St. lost to a team I already had ranked, so I thought a 10-spot drop was enough even though the Bulldogs are also not on my computer list. After that, I knew which teams I wanted to rank (they were all selected from the top 25 of my computer), but when I couldn’t decide the order, I just ranked them by how good the teams who beat them are. For instance, Texas Tech and Maryland (which beat Texas before the Longhorns’ big wins of the past two weeks) had lost to unranked teams. Ole Miss (which beat Texas Tech) has only lost to Alabama, and Temple (which beat Maryland) lost two games, one of which was to Villanova—and it wasn’t in basketball—so that was pretty easy to sort out. I think Oklahoma St. lost to a better team than Texas Tech did, but I couldn’t put the Cowboys ahead of a team who just beat them 41-17 in Stillwater. The five teams that are in the computer top 25 but not in this one are (in order): Buffalo (beat Temple; see above for discussion about Maryland and Texas), Indiana (lost to Michigan St. but is the only team to beat Virginia), Michigan St. (beat Indiana, although the Spartans lost to Arizona St.), San Diego St. (beat Arizona St., only loss is to Stanford), and North Carolina St. (nothing too special, but they are the only team to have beaten James Madison or Marshall; they play Virginia next). San Diego St. has a bye week, so they will be staying out; but any of the others could make it in by winning. I know it sounds silly, but this is especially true of Buffalo, which plays Army. Who knew New York could field decent college football teams, not to mention (possibly) three of them? The third is undefeated Syracuse, who fell just a few spots outside of the top 25 and will attempt to beat Clemson for the second year in a row on Saturday. I do plan to write blogs other than rankings soon, but there weren’t a lot of extra days in the first two weeks. I posted the preseason rankings right before Week 1 started, and there were 5 playing days followed by the midweek Week 1 rankings. I’ll definitely have something to say about the upcoming LSU-Auburn game, possibly on Thursday. I’m dropping Clemson because from what I saw they didn’t deserve to win. I’ll take a controversial close win over a major unranked team on the road if you’re #20 maybe, but not if you’re #2. Later in the season, it just counts as a win, but when we have relatively little information about the teams, you have to look at how they won. If you didn’t see the game or highlights, Texas A&M came close to scoring the potentially tying touchdown in the last few minutes, but the ball was knocked loose. The ruling on the field was a touchback. Although from every angle, it looked like that was wrong, the call stood. I’ll elaborate in the next paragraph, but I’ll warn you it’s a bit of a rant. I don’t think there is any way to create this image if the ball crossed the goal line before going out of bounds. I don’t blame the referee if he simply couldn’t tell and made a guess, but the problem I have is that even if the referee has to flip a coin to decide, you have an incredible burden of proof to change the call. I wish there were an option where the referee could appeal directly to the replay booth if he didn’t see or couldn’t tell. Regardless, the call should have been overturned. Every angle shouldn’t have to be 100% clear. I don’t believe it’s possible that the ball went through the end zone. Never mind that this is the most completely unfair rule in football in the first place. If the ball goes out at your own 1, you keep it, but if you make it 99 yards down the field and you fumble forward (but not backward), it’s a turnover? Absurd. Anyway, despite losing the ball in this ridiculous and unfair fashion, the Aggies were able to get the ball back and score a touchdown anyway. They just weren’t able to get the two-point conversion. 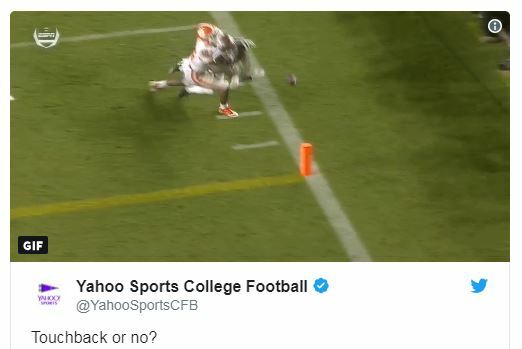 Maybe Clemson would have played differently if they’d gotten the ball up 2 instead of 8 (assuming the same unsuccessful conversion play), but either way they would have wanted to hold onto the ball until the clock ran out. There is a very high chance that had the ruling been correct Texas A&M would have won. I did make a rule for this week that you need to have a win over an FBS opponent from now on, so that explains some of the turnover of teams. I also lowered Notre Dame a little bit for their close win over Ball St., who now has a 10-game losing streak against FBS opponents. I indicated last week that Minnesota and Duke were playing for potential rankings, so I stuck to that. Iowa was ranked at the end of last year, and they just beat Iowa St., who was also ranked for much of last year, so I thought it made sense to put the Hawkeyes back. I mentioned Maryland looked good in Week 1 and despite some trouble early on, they won decisively. Arizona St. got in by beating Michigan St., although the Sun Devils’ offense needs work (as does Iowa’s). Virginia Tech and West Virginia haven’t really impressed me. I don’t think Florida St. and Tennessee (their respective Week 1 opponents) are very good, but the Hokies and Mountaineers were both teams I considered ranking before the season and have done nothing to deserve not being ranked. The only other team that moved a lot was USC. They lost to a good team but didn’t make it very close or beat a very good team in Week 1, so 8 spots seems reasonable. 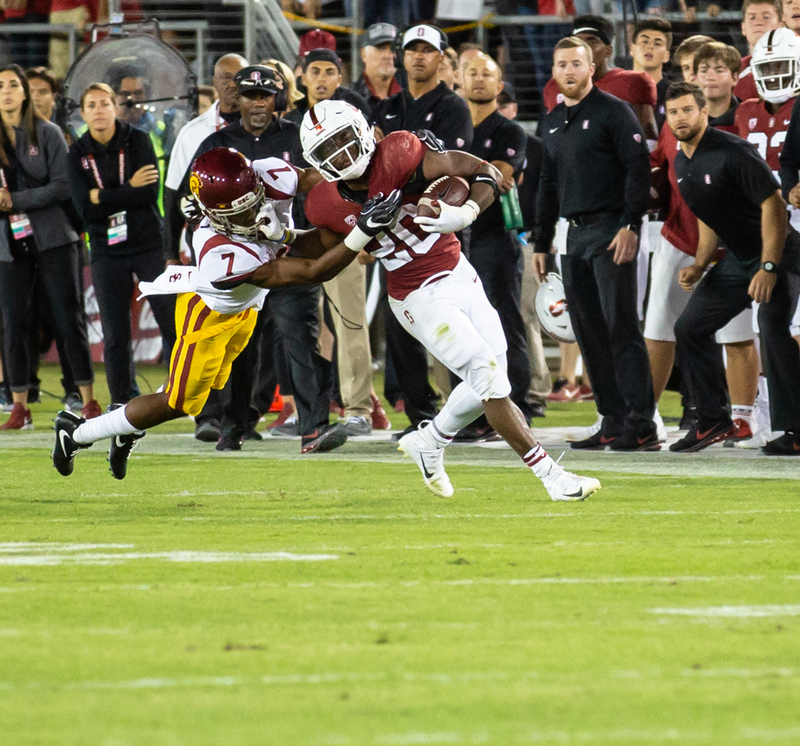 Stanford RB Bryce Love tries to pad his yardage against USC.. He ran for 136 yards for the game. I don’t usually change the rankings too much after the first week, but I’ve modified my approach somewhat. I’ll explain with LSU and U. Miami, which of course was the main game I wanted to talk about anyway. I think U. Miami, for instance, is better than 25th; but they lost and didn’t play very well. That puts them behind most teams at the moment, so it’s a balance between the potential upside of this season and where you are after the one or two results each team has so far (none of the teams below have played two games yet.) In years past, I would have put both teams toward the middle of the top 25. 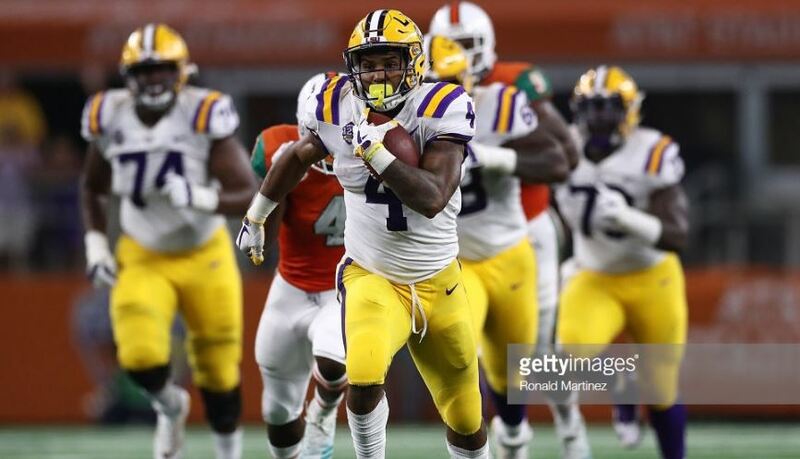 Nick Brossette’s 50-yard run was the only touchdown of more than one yard by the LSU offense against U. Miami (Brossette scored the other one as well). I don’t want to put LSU in the top 15 though since there were still some weaknesses (mostly due to inexperience) exposed. It’s concerning that the Tigers had a worse third-down conversion percentage, fewer first downs, fewer pass completions, fewer yards per pass, and fewer total yards. Without the two interceptions (LSU committed no turnovers themselves), the Tigers would have had a very good chance of losing at the end. It would have changed the final score to 23-17, and that’s if U. Miami didn’t score on the drives in which the interceptions took place and if we assume a late Hurricane punt (rather than a fourth-down-conversion attempt) wouldn’t have given U. Miami good enough field position to score again. Although no one in the top 25 had as disappointing a result as the Hurricanes did, there weren’t any performances by unranked teams that I thought merited them a spot in the top 25. I have to say I was impressed by the performance of the SEC. Tennessee lost as expected, but they kept the game close for longer than I thought they would (West Virginia led only 13-7 at the half). Auburn-Washington was a bit of a coin flip, but I certainly wasn’t counting on that one. I thought LSU and Ole Miss (in Houston against Texas Tech) were likely to lose, but both won easily. I also wouldn’t have been shocked had Vanderbilt lost at home against Middle Tennessee, but they won by 28. Kentucky committed 4 turnovers and was threatened in the first half by Central Michigan, but every other team won by more than I expected. Notre Dame-Michigan was the only non-SEC game between ranked teams. I felt the need to put Michigan behind LSU, but I still expect the Irish and Wolverines to finish close together, as I had them in my preseason rankings. The other major movement in my rankings was in dropping Penn St. and Michigan St. I was concerned by the level of experience in both respective teams, and the close results of their games (Penn St. beat Appalachian St. in overtime, and Michigan St. beat Utah St. by 7) raised my level of concern. Iowa and Maryland did better than I expected, so I’m not down on the Big Ten overall though. They’re both on my rankings watch list, as are Minnesota and Northwestern. In the ACC, I feel vindicated by not ranking Florida St.; but Virginia Tech is another team I have my eye on. Duke is another possibility. There aren’t any other unranked teams worth mentioning right now, but that can always change with upsets. When I updated my ratings, I was really not happy that two teams that don’t even belong in the conversation were fourth and fifth while the team I thought was the deserving #4 was a somewhat distant seventh. If Alabama were fifth, I would have shrugged it off. Last year, after the Army/Navy game, Washington edged out Penn St. for fourth. I think if Penn St. had played Washington at a neutral site last December, Penn St. would have won. I know Penn St. lost the Rose Bowl, but a team going from playing for a national championship to playing for nothing but a bowl win can sometimes be a bit of a letdown. I still think the Penn St. team that won the Big Ten Championship game would have beaten Washington, and I still think that they had a better resume as well. No ratings system is perfect though, and for the two to be so close that the result of one major game (there were also a couple of FCS results added in) could tip the balance was good enough. Also, I don’t really mind the deciding factor when two teams are close being who has fewer losses. But for the arguments I presented over the weekend in Alabama’s favor and to have them that far behind was cause to reevaluate things. I still think I have a really good formula, but approaching each game neutrally has some shortfalls. So I’m going to have two different computer ratings from now on. I considered “power rating”, but I never know what that means, so I’m just going to call it weighted and unweighted. The new rating will be weighted toward success against the best teams. With it unweighted, you get the same credit this year for beating Texas and Temple as you do for beating Alabama and having a bye week. Central Florida beat a lot of teams like Texas and Temple but didn’t even play any teams that were nearly as good as Alabama, Ohio St., USC, etc. This made Wisconsin’s and Central Florida’s 12 wins apiece hard to overcome even though as I pointed out, each only had two wins apiece against the top 40. I could not devise a system I believed in that put Ohio St. ahead of Wisconsin and Central Florida, but by weighting overall strength of schedule and quality wins, I was able to get Alabama ahead of them. 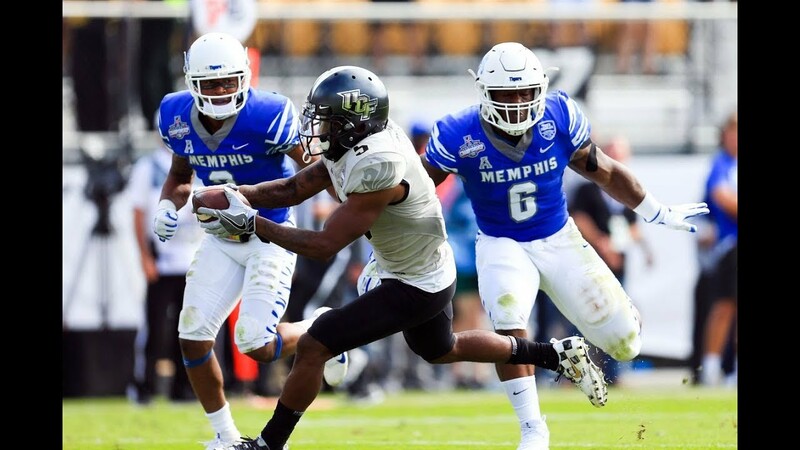 Central Florida-Memphis was a fun game to watch; but being that this was the best team the Knights beat, UCF should not be considered one of the best teams. When I tried to alter the system to allow for more losses without a high penalty in order to push Central Florida and Wisconsin down, it pushed up teams like USC, Notre Dame, and Auburn instead of Ohio St. 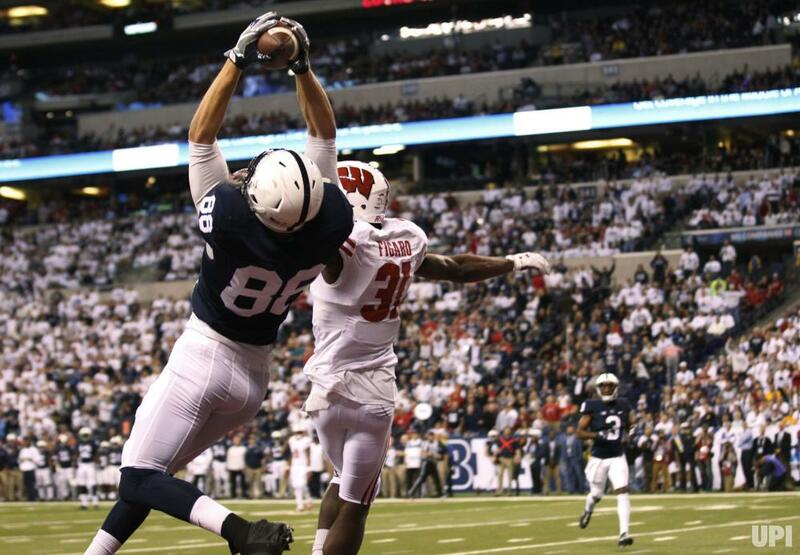 This year, the Big Ten’s problem was depth. Ohio St. only played 7 teams in the top 80 (one out of conference) and Wisconsin played 6. Both Ohio St. and Wisconsin played 10 games against Big Ten opponents, so it should have been higher. By contrast, Alabama played only 8 SEC games and had 9 opponents in the top 80 (Tennessee was the only SEC opponent outside; Florida St. and Fresno St. are both inside the top 80). Oklahoma played 10 games against the top 80 and played 10 conference games (Ohio St. and Tulane are in; Kansas and Baylor are not). Anyway, moving Wisconsin and UCF down a peg for not having very deep schedules is part of the reason Ohio St. fell just slightly below Alabama. People will see me as a Big Ten detractor, but again, I wanted two Big Ten teams in the playoff last year. Also, in both the weighted and unweighted top 9s from last year, there were two other Big Ten teams. Like this year though, I did think the SEC was the best conference top to bottom. How do I figure out which games to add weight to? I mentioned the top 80 above, that roughly corresponds with the positive numbers in my unweighted system. So that’s where I drew the line. It so happens to be just low enough to encompass teams with wins over competitors in the major conference (and in one case a playoff team). So along with Syracuse, the low positive-numbered teams also include Cal (Berkeley), which beat Washington St., and Pittsburgh, which beat U. Miami. So that’s one tier. The next tier includes teams like Ole Miss, Duke, Utah, and Virginia, .500 Power 5 teams. Both Duke and Virginia had good non-conference wins too. It also includes Southern Mississippi, who went 8-4 despite playing two SEC teams in non-conference play. The next tier starts with teams better than 0.3, which right now is the top 45. This is low enough to include Iowa St., which beat both Oklahoma and TCU. It has some slightly better (than the previous tier) Power 5 teams like Kentucky, UCLA, and Texas A&M as well as Group of 5 teams that competed for titles like South Florida, North Texas, and Fresno St. This tier has a little bit more of an increase in points than the last one. The penultimate tier is teams better than 0.55. I made it that instead of an even 0.6 because last year it would have only encompassed 18 teams rather than 24. Right now it encompasses 25 teams instead of 23. Numbers 24 and 25 are San Diego St. and Virginia Tech, so this had nothing to do with trying to tilt the playing field. Clemson would have been #1 anyway. I treated teams better than 0.9 (roughly top 10) a little bit differently. I think whether you win or lose to a top 10 team, you should get a little bit extra consideration. The loss hurts in some parts of the formula, and maybe it shouldn’t hurt as much. So that’s why Auburn and Ohio St. didn’t seem to get the proper credit in the unbalanced formula for playing really good teams out of conference. Also, teams like Wisconsin and Central Florida have less impressive resumes for not beating any top 10 teams. I’m going to show the final top 10 for both this year and last year. If I had to make a list of teams most likely to compete well in a playoff now and at the end of last year, I’m not sure the membership of either top 10 or top 5 would be any different. Clemson would win obviously, but if I forced Clemson to be higher last year, the formula would move Central Florida higher this year. The whole point was to help teams with good opponents. Clemson and Penn St. were both safely in the top 4 and nearly tied last year, so I’m fine with how it turned out. If you couldn’t tell, the number at the end is where the teams fell in my unweighted ratings. I think with so many more opponents in flux or not yet attaining enough points (for instance, only 4 teams qualified for the second-highest tier in my first list this year), the weighted version may be less useful early on. I plan to start publishing both lists at the usual times (Saturday night or early Sunday morning between about October 1 and December 15 and the night of the national championship) though. As I did last week, the only modification from the computer rating was to put the best five undefeated teams at the top. This required moving Clemson down to spots, Notre Dame down one spot, Central Florida up one spot, and Wisconsin up two spots. I know people aren’t going to be impressed with Central Florida, but I wanted to remind them that unlike the polls, you don’t just drift upward by remaining undefeated (which is why teams like this are kept toward the back of the pack early on). I would not be surprised if the Knights fell out of the top 5 after playing Austin Peay next week; and apart from the finale against South Florida, UCF has already played its better opponents. This could allow several teams (including TCU and U. Miami if they stay undefeated) to pass them up between now and then. This ties into my previous couple of blogs. I’m going to say right upfront that Alabama will be protected at #1 for one more week even if they are passed up in the computer rating during next week, in which Penn St. plays Ohio St. and Alabama does not play. If the Nittany Lions lose, Alabama will likely be safe anyway. If Penn St. and Alabama are still undefeated after November 4, I’m just going to let the system play out on its own from there. I haven’t griped about the polls much, because to be fair they’re not ridiculously far off; but I wanted to do a blind resume test like reporters commonly do with basketball teams around March. I am using my own ratings, but this doesn’t vary much from the polls and other mainstream ratings as far as the evaluation of other teams. Team A has won three in a row, but team B lost in the last two weeks. Team A is 3-2 against the top 50, and team B is 1-2. Team A is 4-2 against the top 75, and team B is 2-2. Team A beat team B. Team A and team B have identical records. In what world does team B get ranked higher? This one! Take either poll, locate LSU, and then locate Auburn. LSU is team A, and Auburn is team B. Is it because Malzahn wears a visor and talks about controlling his own destiny even though it isn’t true (as opposed to Orgeron’s “one game at a time” mantra)? Anyway, I updated and added a little bit more information to the LSU-Ole Miss Rivalry blog. I have a whole page dedicated to the Alabama series. 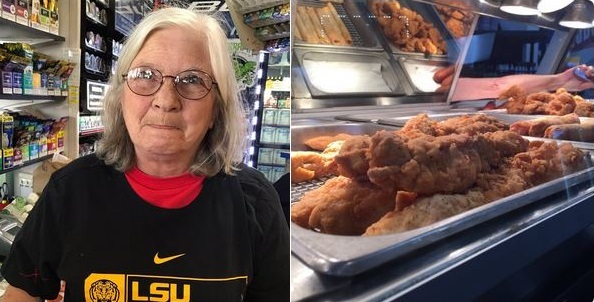 I also found it amusing that the cook of the famous “chicken on a stick” that Orgeron talked about (he said she was the only person he remembered that he wanted to see in Oxford) was located at the Four Corners Chevron (Orgeron had misremembered it as an Exxon during the press conference). Her name is Phyllis, and she is still a Coach O (and by extension LSU) fan. She said she wanted to visit Coach O in Baton Rouge but never has the money. I hope now that she’s been discovered some LSU fans can rectify that problem. Phyllis (in a T-shirt given by the LSU equipment staff) and the famous “chicken on a stick”.